At 7 a.m., English professor Nina Lambert walks into the computer lab and sees Myka Morehead already with her head in her books studying and grinding through her homework. Morehead is a full-time student and plays on the Harvesters volleyball team. Morehead is taking 26 hours this semester and will take 18 next spring. The deciding factor for Morehead to attend Eastfield was the LeCroy Scholarship. The LeCroy Scholarship is Dallas County Community College scholarship that only eight people in the district received this academic year. The LeCroy Scholarship is a leadership scholarship that covers the scholars’ full-tuition and books for up to six semesters. Two Eastfield students were chosen as LeCroy scholars for 2015-16: Morehead and Andrea Carrizales, president of Eastfield’s Rotaract Club, vice president of Phi Theta Kappa and Student Government Association and managing editor for the Et Cetera. Returning LeCroy scholars at Eastfield are Michael Heggie and Rachel Quiroga Hugo. The LeCroy Scholarship was Morehead’s first major scholarship, and she said it inspired her to apply for more. She has received scholarships from, Bill J. Priest Endowed Scholarship, Ronald McDonald House Charities, Max W. Schlotter Region 6 Education Board, American Red Cross, National Honor Society, Navasota Valley Electric and several scholarships from Milano High School. While at Milano High School, Morehead served as vice president of Future Farmers of America, editor of the yearbook and was a member of the National Honor Society. She was also the salutatorian of her graduating class. Morehead credits her success to having to grow up quickly as a child. When Morehead was 5 years old her father had both legs amputated due to diabetes. Morehead said that her and her father were very close. During Morehead’s freshman year of high school her father died. 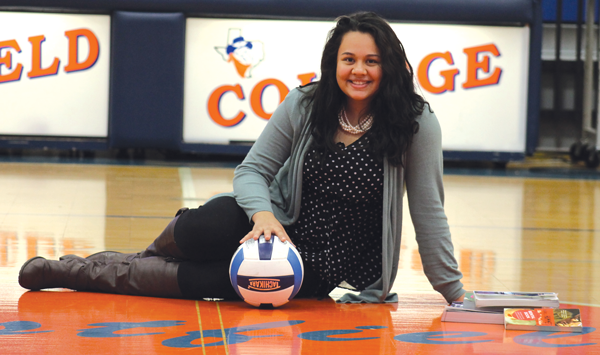 Morehead turned to volleyball for comfort. Morehead was named First All-District, All-State and the Regional All-Tournament Team in high school. Alyssa Jimenez, one of Morehead’s teammates, called her a “social butterfly” and said that she is constantly happy. Jimenez also said Morehead is leader and that while she was injured she was there con- stantly encouraging the team. Morehead came down on her ankle wrong earlier in the season and was out for a couple weeks. She was named honorable mention this year for the Eastfield Harvesters and Coach Brandon Crisp said that Morehead is a great player on and off the court. Crisp has said Morehead has always been a great player, and always wants to help everyone out there.